Christian Horner has called for the rules to change after his Red Bull drivers were handed heavy penalties ahead of the Italian Grand Prix for changing their engines. 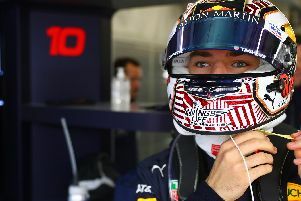 Daniel Ricciardo looks set to suffer a 20-place grid penalty for Sunday's race, while team-mate Max Verstappen will likely lost 15 places as a result of using extra engine parts beyond their allocation of four for the season. "I think they're starting near Milan!" said Red Bull boss Horner. "We obviously knew we'd have to incur penalties at some stage, so we felt we needed to take as much as we could. We've just got to pick the right circuit to take it." McLaren have been most heavily punished recently as a result of their Honda engine woes - Stoffel Vandoorne was handed a 75-place penalty (despite there only being 20 cars on the grid) for the Belgian Grand Prix, while team-mate Fernando Alonso will suffer a 35 place drop at Monza. Horner believes the grid-penalty system is unfair on the driver, who is an innocent victim, and that penalising teams constructors' championship points is a far better way of apportioning blame. He said: "It's not an elegant way of dealing with the problem. We will problem is we'll probably need another penalty before the end of the year, but we're dropping down to three engines next year, but we're adding another race. "We've spoken about it at the strategy group, but no-one thought to change it. It doesn't add anything to the show, throwing all these penalties out. It's unfair on the driver too, they've done nothing wrong but they take the penalty. We want ot reduce cost by reducing the number of engines we use, but we're going to use the engines anyway and take the penalties and spoiling the grid. "These extra engines do the world tour, they're built anyway, and the cost is already incurred. There just needs to be a better way of dealing with it. "I think losing constructors' points is a more elegant way of dealing with it - you get a penalty without putting a driver down the back of the grid. "It needs a strong decision from the top." Ricciardo was fifth fastest in FP1 at Monza, with Verstappen sixth. Lewis Hamilton dominated the session, leading his Mercedes team-mate Valtteri Bottas.